We were appointed to redesign the Destination UK guide so it reflected the world-class and supreme luxury aspects of the superyacht industry; and to review the advertising package to increase revenue to pay for it. 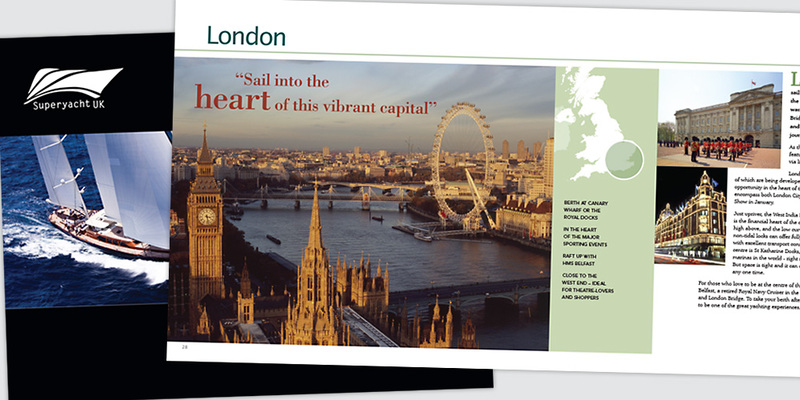 We reviewed the design, content and pagination to create a brochure with the clear purpose of promoting the UK as a prime superyacht destination and promoting Superyacht UK members to a global audience of captains, owners and reps. High-quality stock and a new size set it apart from standard publications giving it greater appeal to an elevated audience and was supported by a digital version. Our creativity had increased salience with luxury brand advertisers, making the publication very nearly cost neutral and is still in use two years on. Precision Creative and Media are BMF members and I’ve had the pleasure of working with them on a number of occasions. The team has real creativity and encourages clients to look strategically before starting on the practicals. With high standards of professionalism and customer service, I’d do business with them again when I have the chance.